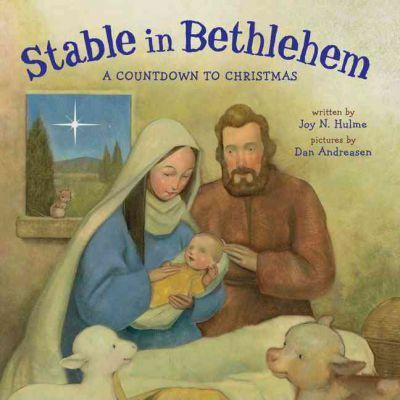 Illustrated with stunning, jewel-toned art, and featuring a festive foil-trimmed jacket, this gracefully written picture book captures the true Christmas spirit in a way children can easily understand. In tender verse that flawlessly incorporates simple counting, Joy Hulme describes the night Jesus was born in a manger, surrounded by animals and with only straw to pillow his head. From the "eight" shepherds watching their flock to "five "angels singing, from "three" wise men bearing gifts to "two" parents looking with tender love upon "one "small baby, each image evokes what's most meaningful about this special day. Joy N. Hulme lives in Monte Sereno, CA, where she writes picture books, pop-up books, and historical novels. She has 24 grandchildren! Illustrator Dan Andreasen has illustrated numerous picture books, including "By the Dawn's Early Light: The Story of the Star-Spangled Banner," by Steven Kroll, which was named an ABA Kids' Pick of the Lists and a Notable Children's Trade Book in the Field of Social Studies; "A Quiet Place," by Douglas Wood; and "Sailor Boy Jig," by Margaret Wise Brown. He has also illustrated several of Sterling's top-selling "Classic Starts." Dan lives in Medina, OH, with his wife and three children.